Members of Capstone Agency before CreateAthon began. Photo courtesy of Sarah Dougherty. 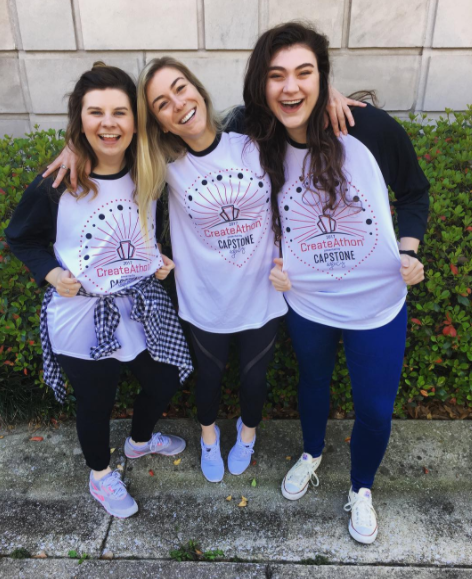 This year is the beginning of the partnership between PRSSA National and CreateAthon, and I had the unique opportunity to experience this both as a part of The University of Alabama’s Nationally Affiliated Student-run Firm, Capstone Agency, and the 2016–2017 National Committee. It was 24 hours of creativity, bonding and service that I cannot say enough great things about. So what is CreateAthon? It is a 24-hour work sprint to produce communications materials for nonprofit organizations. Capstone Agency served seven nonprofits in the Birmingham and Tuscaloosa area, including Tuscaloosa Metro Animal Shelter, First Presbyterian Church of Tuscaloosa, Alabama SPCA, Good Samaritan Clinic, Arts ‘n Autism, Alabama Writer’s Conclave and Camp Fire Alabama. 12 p.m.: Kick-off! The team prepared for the event with Chick-Fil-A lunch and a Skype call with Teresa Coles, co-founder of CreateAthon. We also highlighted the schedule of events and work, room assignments and the nitty-gritty of what was to come. 1–5 p.m.: Off to the races. Teams headed to their “homes” for the next 23 hours — some in our Capstone Agency office, others in larger lab classrooms, depending on the demands of what their project would require. To-do lists, timelines for the evening and research analysis began. Each team had unique tasks and approached the 24-hour deadline in different ways that worked efficiently for them. 5 p.m.: Surprise! Two puppies from the Tuscaloosa Metro Animal Shelter stopped by so associates could get some love and time outside. 6–9 p.m.: Dinner time. Another fun surprise was courtesy of Moe’s Southwest, who generously donated free burritos for everyone. Teams took turn going to dinner, with some using the break as a chance to relax and others taking their meals to-go to continue the work momentum. This helped break up the evening as associates started to get sleepy or antsy in their offices. 9 p.m.–12 a.m.: Let’s get down to business. Logo designs were being vetted, content for deliverables being drafted and tactical work was beginning to come to fruition. 12 a.m.: #SnacksOnSnacks. The leadership team made an late-night Walmart run for some classic pick-me-ups: pizza rolls, chips, Starbucks double-shots, Red Bull, Diet Coke and candy. Some campus reps from Insomnia Cookie also dropped by to share the love with some cookies. Teams enjoyed a little snack and caffeine break before surveying what needed to be done for the remaining 12 hours. 1–3 a.m.: All hands on deck. One team had polished their communication plan and deliverables enough to run home for a quick nap (lucky ducks! ), while other teams began editing and producing their client presentations. The coffee was flowing and some great ideas were being brought to life. 3–6 a.m.: “The dark time.” I jokingly think about this late-night time period as the one where everyone was getting sleepy, had eaten a lot of junk food and still had a lot to do. Some people were pushing through, others needed a nap and some were just ready to brush their teeth. 6–10 a.m.: The final countdown. Approvals, client presentations and printed materials were being finalized before the seven clients arrived at Capstone Agency. 10 a.m.–12 p.m.: Show and tell. Our nonprofit clients arrived and were presented the team’s work from the last 24 hours. There were so many smiles and happy tears as students helped lighten the workload and show the energy they had invested in each nonprofit client. It was awesome. 12 p.m.: We did it! 12:45 p.m.: Home and in bed. Reflecting on my CreateAthon experience, I am so thankful to have helped our firm engage with our community. It was refreshing to meet new people and have each associate’s undivided attention for 24 hours; no one was worried about getting to class or work on time, no one had dinner plans, etc. The focus was all on surpassing client expectations and as a result, I was able to get to know people better and enjoy the process. If this sounds like something your firm might be interested in, consider applying to host CreateAthon next year and reach out to Vice President of Professional Development Liz Skeele for more information.